World Press Photo Exhibition is Here! Purchase your tickets to the Opening Night VIP Reception this Friday (10/26) at 6:30pm by clicking the following link: Opening Night VIP Reception -- presented by the Lightscape Foundation. 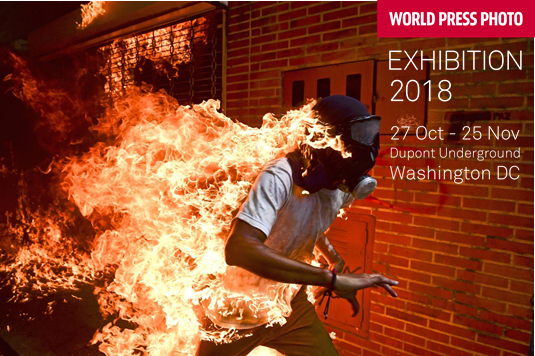 Visit the World Press Photo Exhibition 2018 on its world-wide tour showcasing the stories that matter, with photography from the 61st annual World Press Photo contest. The winners were chosen by an independent jury that reviewed more than 73,000 photographs entered by 4,548 photographers from 125 countries. The DC exhibition will also host powerful photography from the African Photojournalism Database (APJD), the International Women's Media Foundation (IWMF), and Agence France-Presse (AFP). - Audio guides will be available at no charge (first-come first served). - Children under 14 free admission (accompanied by an adult due to sensitive nature of some content). - VIsitors can register to return multiple times (on multiple days). The Dupont Underground is located near the Dupont Circle metro station. The entrance can be found on where 19th Street meets Dupont Circle (between the Starbucks and Hotel Dupont).